How to Cite This Chapter: Leontiadis GI, Bartnik W. Peptic Ulcer Disease. McMaster Textbook of Internal Medicine. Kraków: Medycyna Praktyczna. https://empendium.com/mcmtextbook/chapter/B31.II.4.6 Accessed April 20, 2019. Chey WD, Leontiadis GI, Howden CW, Moss SF. ACG Clinical Guideline: Treatment of Helicobacter pylori Infection. Am J Gastroenterol. 2017 Feb;112(2):212-239. doi: 10.1038/ajg.2016.563. Epub 2017 Jan 10. Erratum in: Am J Gastroenterol. 2018 Jul;113(7):1102. PubMed PMID: 28071659. Malfertheiner P, Megraud F, O'Morain CA, et al; European Helicobacter and Microbiota Study Group and Consensus panel. Management of Helicobacter pylori infection-the Maastricht V/Florence Consensus Report. Gut. 2017 Jan;66(1):6-30. doi: 10.1136/gutjnl-2016-312288. Epub 2016 Oct 5. PubMed PMID: 27707777. Fallone CA, Chiba N, van Zanten SV, et al. The Toronto Consensus for the Treatment of Helicobacter pylori Infection in Adults. Gastroenterology. 2016 Jul;151(1):51-69.e14. doi: 10.1053/j.gastro.2016.04.006. Epub 2016 Apr 19. Review. PubMed PMID: 27102658. Coxib and traditional NSAID Trialists' (CNT) Collaboration, Bhala N, Emberson J, Merhi A, Abramson S, et al. Vascular and upper gastrointestinal effects of non-steroidal anti-inflammatory drugs: meta-analyses of individual participant data from randomised trials. Lancet. 2013 Aug 31;382(9894):769-79. doi: 10.1016/S0140-6736(13)60900-9. PubMed PMID: 23726390; PubMed Central PMCID: PMC3778977. Lau JY, Sung J, Hill C, et al. Systematic review of the epidemiology of complicated peptic ulcer disease: incidence, recurrence, risk factors and mortality. Digestion. 2011;84(2):102-13. doi: 10.1159/000323958. Review. PubMed PMID: 21494041. Lanza FL, Chan FK, Quigley EM; Practice Parameters Committee of the American College of Gastroenterology. 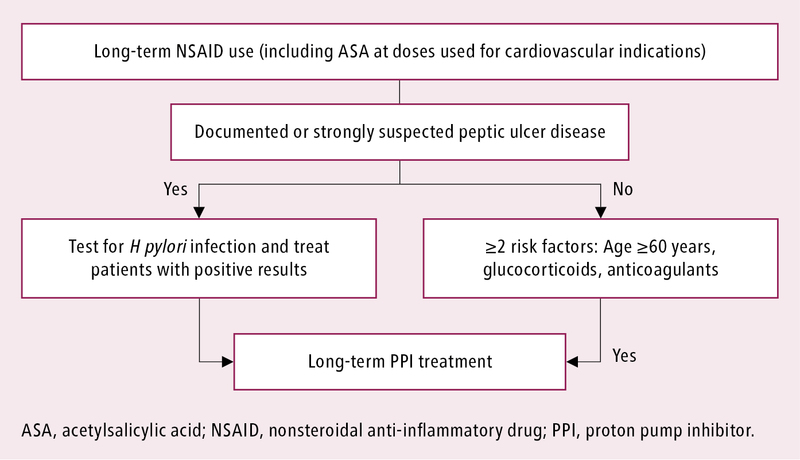 Guidelines for prevention of NSAID-related ulcer complications. Am J Gastroenterol. 2009 Mar;104(3):728-38. doi: 10.1038/ajg.2009.115. PubMed PMID: 19240698. Bhatt DL, Scheiman J, Abraham NS, et al; American College of Cardiology Foundation; American College of Gastroenterology; American Heart Association. ACCF/ACG/AHA 2008 expert consensus document on reducing the gastrointestinal risks of antiplatelet therapy and NSAID use. Am J Gastroenterol. 2008 Nov;103(11):2890-907. doi: 10.1111/j.1572-0241.2008.02216.x. PubMed PMID: 18853965. Yeomans ND, Svedberg LE, Naesdal J. Is ranitidine therapy sufficient for healing peptic ulcers associated with non-steroidal anti-inflammatory drug use? Int J Clin Pract. 2006 Nov;60(11):1401-7. Review. PubMed PMID: 17073837; PubMed Central PMCID: PMC1636688. Ford AC, Delaney BC, Forman D, Moayyedi P. Eradication therapy for peptic ulcer disease in Helicobacter pylori positive patients. Cochrane Database Syst Rev. 2006 Apr 19;(2):CD003840. Review. Update in: Cochrane Database Syst Rev. 2016;4:CD003840. PubMed PMID: 16625592. Kurata JH, Nogawa AN. Meta-analysis of risk factors for peptic ulcer. Nonsteroidal antiinflammatory drugs, Helicobacter pylori, and smoking. J Clin Gastroenterol. 1997 Jan;24(1):2-17. PubMed PMID: 9013343. Peptic ulcer disease (PUD) is a recurring formation of gastric and/or duodenal peptic ulcers. A peptic ulcer is a demarcated mucosal defect extending through the muscularis mucosa with associated inflammatory infiltrates and coagulative necrosis. Peptic ulcers are most frequently located in the duodenal bulb or in the stomach, less commonly in the lower part of the esophagus or the duodenal loop. Etiology: frequently Helicobacter pylori infection, nonsteroidal anti-inflammatory drugs (NSAIDs); rarely, critical illness, Zollinger-Ellison syndrome, glucocorticoids in combination with NSAIDs, other drugs (potassium chloride, bisphosphonates, mycophenolate mofetil). H pylori infection is responsible for >50% of duodenal and gastric ulcers. It is able to survive in the gastric environment thanks to the production of urease, which degrades urea, thus releasing ammonia that neutralizes gastric acid and creates a less acidic microenvironment within the gastric mucus layer. Initially, H pylori causes acute gastritis in the prepyloric region, which after several weeks progresses to chronic gastritis; H pylori also induces hypergastrinemia, leading to an increased secretion of hydrochloric acid, which plays an important role in the pathogenesis of duodenal ulcers. All NSAIDs, including acetylsalicylic acid (ASA) (even at the low doses used for cardiovascular indications), damage the gastrointestinal (GI) mucosa, primarily by reducing the production of prostaglandins as a result of inhibition of cyclooxygenase-1 (COX-1), and are associated with ulcer generation. The extent to which NSAIDs damage the mucosa depends on the type of NSAID, but all increase the risk of peptic ulceration; moreover, they inhibit platelet activity and, to a various degree, increase the risk of bleeding from those ulcers. The risk of serious upper GI events (including bleeding) is doubled with selective cyclooxygenase-2 (COX-2) inhibitors (coxibs) or diclofenac and quadrupled with naproxen or ibuprofen.Evidence 1Moderate Quality of Evidence (moderate confidence that we know true effects of the intervention). Quality of Evidence lowered due to the indirect nature of data we use to infer the relative effects of different drugs. Coxib and traditional NSAID Trialists' (CNT) Collaboration, Bhala N, Emberson J, Merhi A, Abramson S, et al. Vascular and upper gastrointestinal effects of non-steroidal anti-inflammatory drugs: meta-analyses of individual participant data from randomised trials. Lancet. 2013 Aug 31;382(9894):769-79. doi: 10.1016/S0140-6736(13)60900-9. PubMed PMID: 23726390; PubMed Central PMCID: PMC3778977. Clopidogrel, an antiplatelet drug, is unlikely to be ulcerogenic per se for the upper GI tract, but it significantly increases the risk of bleeding of gastric erosions and ulcers caused by other drugs or H pylori infection. The use of this drug should be taken into account when assessing the risk of bleeding from peptic ulcers. Risk factors for mucosal damage by NSAIDs include a history of peptic ulcers or bleeding ulcers, H pylori infection, age ≥60 years, concomitant administration of several NSAIDs, treatment with high-dose NSAIDs, and NSAIDs combined with glucocorticoids (the induction of peptic ulcers by glucocorticoid monotherapy has not been proven) or anticoagulants. The leading symptom is epigastric pain or epigastric discomfort. In patients with duodenal ulcers, the pain typically occurs in the fasting state (often at night or early in the morning) and resolves after consuming food or taking antacids. Epigastric pain is not specific for peptic ulcers; in ~50% of cases, it may be caused by other conditions, most frequently by functional dyspepsia. Nausea and vomiting may occur. However, the course of PUD is often asymptomatic, especially in patients receiving NSAIDs who may develop bleeding or perforation as the first presentation. Possible complications: see Complications, below. 1. Endoscopy: A gastric ulcer is a sharply demarcated circular mucosal defect or an irregular cavity with infiltrated edges, most often located at the lesser curvature or in the prepyloric region. It is usually isolated, although ulcers caused by NSAIDs may be multiple. Duodenal ulcers are most frequently found in the anterior wall of the bulb. Mucosal defects smaller than an arbitrary size of 5 mm in diameter are called erosions. Upper GI bleeding warrants urgent endoscopy (see Gastrointestinal Bleeding). a) Urease test (most commonly used): A specimen of the gastric mucosa is placed on a plate containing urea and a color indicator. The degradation of urea to ammonia by bacterial urease alkalinizes the medium, causing a change in its color. Sensitivity is 90% and specificity is 95%. b) Histology of a mucosal specimen obtained from the antrum (an additional sample from the gastric body increases sensitivity). Sensitivity and specificity are ~95%. c) Bacterial culture of a mucosal specimen: This allows the determination of antimicrobial sensitivity. Specificity is 100% but sensitivity is poor. a) Urea breath test: A solution containing portions of 13C- or 14C-labeled urea are consumed by the patient. The urea is hydrolyzed by bacterial urease to labeled CO2, which is measured in the expired air after 30 minutes. This test can either be performed in the office (the vials of expired air are then mailed to a central laboratory) or in a laboratory. Both sensitivity and specificity are >95%. b) H pylori stool antigen test: A laboratory test using the enzyme-linked immunosorbent assay (ELISA) and monoclonal antibodies (not the office-based rapid test kits); the test is almost as accurate as the breath test. c) Serology: Serologic assays are useful in epidemiologic research but less so in clinical practice. This is because a positive result does not indicate an ongoing infection, since antibodies are still detectable for 1 or more years after treatment. Laboratory-based ELISAs are better validated than whole blood office-based kits and can be used in clinical practice in special situations, such as patients who cannot safely withhold PPI treatment for 2 weeks and in whom other tests were negative while receiving PPIs. Overall, invasive tests (urease test or histology) are used when endoscopy is required for another reason. Rarely, endoscopy may be indicated solely for obtaining mucosal samples for culture and antimicrobial sensitivity in refractory H pylori infection. In most clinical scenarios, the urea breath test is the preferred test both pre- and posttreatment. The diagnosis of ulcer is based on endoscopy. Other causes of dyspepsia, nausea and vomiting, and epigastric pain ([Table 1 in Abdominal Pain]). To assess the nature of the gastric ulcer (benign or malignant), it is customary to perform a histologic evaluation of ≥6 specimens taken from the edges and the floor of the ulcers. In duodenal ulcers, a biopsy is only indicated when etiology different from H pylori infection or NSAIDs is suspected. 1. Diet: Although patients often identify specific foods that cause or worsen the symptoms, there is no evidence that any specific diet, restriction of coffee, or moderate alcohol consumption helps in the healing of peptic ulcers. 2. Avoidance of smoking is recommended. Tobacco smoking is a risk factor for peptic ulcers, which also delays their healing and increases the risk of their recurrence.Evidence 2Strong recommendation (benefits clearly outweigh downsides; right action for all or almost all patients). Low Quality of Evidence (low confidence that we know true effects of the intervention). Quality of Evidence lowered due to the observational nature of studies, indirectness (studies conducted several decades ago), heterogeneity, and imprecision. Kurata JH, Nogawa AN. Meta-analysis of risk factors for peptic ulcer. Nonsteroidal antiinflammatory drugs, Helicobacter pylori, and smoking. J Clin Gastroenterol. 1997 Jan;24(1):2-17. PubMed PMID: 9013343. Lau JY, Sung J, Hill C, et al. Systematic review of the epidemiology of complicated peptic ulcer disease: incidence, recurrence, risk factors and mortality. Digestion. 2011;84(2):102-13. doi: 10.1159/000323958. Review. PubMed PMID: 21494041. Maity P, Biswas K, Roy S, Banerjee RK, Bandyopadhyay U. Smoking and the pathogenesis of gastroduodenal ulcer--recent mechanistic update. Mol Cell Biochem. 2003 Nov;253(1-2):329-38. Review. PubMed PMID: 14619984. 3. Avoidance of NSAIDs or, if NSAIDs cannot be avoided, use of gastroprotective treatment (see below). H pylori should be eradicated in patients with PUD.Evidence 3Strong recommendation (benefits clearly outweigh downsides; right action for all or almost all patients). High Quality of Evidence (high confidence that we know true effects of intervention). High Quality of Evidence despite heterogeneity, which was due to magnitude and not the direction of effect. Ford AC, Delaney BC, Forman D, Moayyedi P. Eradication therapy for peptic ulcer disease in Helicobacter pylori positive patients. Cochrane Database Syst Rev. 2006 Apr 19;(2):CD003840. Review. Update in: Cochrane Database Syst Rev. 2016;4:CD003840. PubMed PMID: 16625592. Further eradication indications: Table 1. 1) The bismuth-containing quadruple therapy includes 14-day treatment with a PPI (esomeprazole 20 mg bid, lansoprazole 30 mg bid, omeprazole 20 mg bid, pantoprazole 40 mg bid, or rabeprazole 20 mg bid), bismuth subsalicylate 525 mg qid, metronidazole 250 mg qid, and tetracycline 500 mg qid. Alternatively, a combined preparation containing bismuth subcitrate potassium 140 mg, metronidazole 125 mg, and tetracycline 125 mg in 1 capsule can be used in a dose of 3 capsules qid with a PPI bid. 2) The concomitant therapy includes 14-day treatment with a PPI, clarithromycin 500 mg, metronidazole 500 mg, and amoxycillin 1 g, all bid. 2. 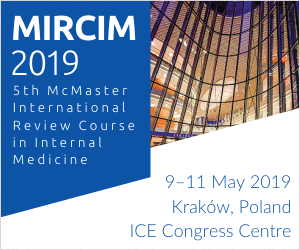 In regions where H pylori strains resistant to clarithromycin are rare, clarithromycin can still be used as a first-line agent within the conventional triple therapy: 14-day treatment with a PPI (dosage as above) + clarithromycin 500 mg bid + either amoxicillin 1 g bid or metronidazole 500 mg bid. Increasing the duration of the triple therapy increases eradication rates: 7-day regimens should not be used, while the 14-day regimens are more effective than the 10-day regimens. Therefore, the recommended duration of triple therapy is 14 days.Evidence 4Strong recommendation (benefits clearly outweigh downsides; right action for all or almost all patients). Moderate Quality of Evidence (moderate confidence that we know true effects of the intervention). Quality of Evidence lowered due to some heterogeneity and unclear risk of bias. Yuan Y, Ford AC, Khan KJ, et al. Optimum duration of regimens for Helicobacter pylori eradication. Cochrane Database Syst Rev. 2013 Dec 11;(12):CD008337. doi: 10.1002/14651858.CD008337.pub2. Review. PubMed PMID: 24338763. 3. The patients should be tested to prove eradication at least 1 month after the completion of the antibiotic therapy. 1) Patients with duodenal ulcers should be tested with noninvasive methods. There is no need to repeat endoscopy for these patients unless severe symptoms persist or reoccur. Similarly, there is no need for PPI treatment after the 14-day eradication regimen unless severe symptoms persist or reoccur. 2) Patients with gastric ulcers at endoscopy require PPI treatment (standard doses once daily; see above) for 1 to 2 months and should have repeat endoscopy to confirm complete healing of the ulcers at the end of the treatment. During the repeat endoscopy, biopsies from nonulcerated mucosa can be obtained to test for H pylori infection, and if the ulcers have not healed completely, additional mucosal samples should be obtained from the base and edges of the ulcers (to exclude malignancy) and repeat endoscopy scheduled after a repeat course of PPI treatment. 1) Failure of the bismuth-containing quadruple therapy: Use levofloxacin 500 mg bid + amoxicillin 1 g bid + PPI bid (doses as above). 2) Failure of clarithromycin-containing regimens: Use the bismuth-containing quadruple therapy or the levofloxacin-containing regimen (see above). Patients with second-line treatment failure must be treated according to the actual antibiotic resistance of the H pylori strain. 5. Bleeding peptic ulcer: Extended treatment with a PPI aimed at achieving an increased speed and rate of ulcer healing. 1. A PPI or H2-blocker for 1 to 2 months is usually effective. 1) A PPI once daily, in the morning, 20 to 30 minutes before a meal. Dosage: esomeprazole and pantoprazole 40 mg daily, lansoprazole 30 mg daily, omeprazole and rabeprazole 20 mg daily. 2) H2-blockers inhibit the secretion of hydrochloric acid stimulated by histamine. These agents are less effective than PPIs and their repeated dosing leads to tolerance (reduced pharmacodynamic effect); therefore, we prefer not to use those.Evidence 5Strong recommendation (downsides clearly outweigh benefits; right action for all or almost all patients). High Quality of Evidence (high confidence that we know true effects of the intervention). Yeomans ND, Svedberg LE, Naesdal J. Is ranitidine therapy sufficient for healing peptic ulcers associated with non-steroidal anti-inflammatory drug use? Int J Clin Pract. 2006 Nov;60(11):1401-7. Review. PubMed PMID: 17073837; PubMed Central PMCID: PMC1636688. Goldstein JL, Johanson JF, Hawkey CJ, Suchower LJ, Brown KA. Clinical trial: healing of NSAID-associated gastric ulcers in patients continuing NSAID therapy - a randomized study comparing ranitidine with esomeprazole. Aliment Pharmacol Ther. 2007 Oct 15;26(8):1101-11. PubMed PMID: 17894652. However, H2-blockers could be used in patients who do not tolerate PPIs because of suspected adverse effects. Dosage, when used: famotidine 40 mg once daily at bedtime, ranitidine 150 mg bid or 300 mg once daily at bedtime. 2. There is no need to repeat endoscopy for duodenal ulcers unless severe symptoms persist. If the ulcer was initially associated with NSAIDs with or without H pylori infection and neither of these 2 risk factors is present any longer, treatment need not be prolonged for more than 1 to 2 months, provided that the patient is asymptomatic. Similar to the H pylori-positive ulcers, endoscopy should be repeated in patients with gastric ulcers 1 to 2 months after the initial endoscopy. If the ulcers have not healed completely, repeat biopsy samples should be obtained from the ulcers to exclude undiagnosed malignancy. 3. Causes of treatment failure: Use of NSAIDs by the patient, false-negative H pylori test results, noncompliance, or other causes of the ulcer. Surgical treatment does not eliminate the risk of ulcer recurrence and is associated with late complications. Main potential indications: ineffectiveness of pharmacotherapy (failure to heal the ulcer, frequent [≥2 times a year] and early [<3 months after treatment] recurrence of ulcers after exclusion of other causes of ulcers including Zollinger-Ellison syndrome), ulcer complications (perforation, hemorrhage, pyloric stenosis) not responding to pharmacotherapy. 1) Duodenal ulcers: Usually highly selective vagotomy or truncal vagotomy with antrectomy. In the case of pyloric stenosis, truncal vagotomy with pyloroplasty or vagotomy with antrectomy. a) For ulcers in the gastric body, partial gastrectomy with gastroduodenal anastomosis without vagotomy. b) For ulcers in the prepyloric region or gastric ulcers plus duodenal ulcers, vagotomy with antrectomy. c) For ulcers in the subcardial region, partial gastrectomy including the pyloric region. 1. Upper GI bleeding manifests as bloody or coffee-ground emesis and/or bloody or tarry stools. Treatment: [Table 1 in Gastrointestinal Bleeding]. 2. Perforation manifests as a sudden, severe, piercing epigastric pain followed by rapidly developing symptoms of diffuse peritonitis. In >50% of patients, there are no preceding dyspeptic symptoms. This complication often requires surgical intervention. 3. Pyloric stenosis results from permanent scarring or edema and inflammation associated with an ulcer located in the pylorus or duodenal bulb. It manifests as gastric retention, nausea, and profuse vomiting; some patients develop hypokalemia and alkalosis. In the course of antiulcer treatment, the inflammation and edema subside, and patency of the pylorus may improve. Endoscopic dilation or surgical treatment may be indicated in patients with persistent stenosis. In patients at risk of ulcer recurrence or complications due to the use of NSAIDs in whom these drugs cannot be discontinued or replaced with less harmful agents (eg, acetaminophen [INN paracetamol]), use full antiulcer doses of a PPI as an adjunct to NSAIDs (Figure 1). The use of film-coated (releasing the active substance in the small intestine) or buffered preparations of ASA does not reduce the risk of complications. Do not replace ASA with clopidogrel to reduce the risk of recurrent ulcer bleeding in high-risk patients; such an approach is inferior in terms of the bleeding risk to the use of ASA in combination with a PPI. Before a planned long-term treatment with NSAIDs, particularly in patients with a history of ulcer disease, test for H pylori infection and administer eradication treatment if the result is positive. a In regions with a low prevalence of Helicobacter pylori infection, the effectiveness of this strategy is low and an empiric acid inhibition is an equivalent option. b In patients who are already receiving long-term NSAID treatment, it is recommended to combine eradication with proton pump inhibitor administration. MALT, mucosa-associated lymphoid tissue; NSAID, nonsteroidal anti-inflammatory drug. Figure 1. Limiting the risk of ulcer complications associated with the use of nonsteroidal anti-inflammatory drugs. Based on Circulation (2008 Oct 28;118:1894-909).